Ripley’s believe it or not Pattaya is an attraction like no other. A real eye opener to the very strange and weird things around the world. Occupying the entire top floor of the Royal Garden Plaza shopping mall. This is more of a gallery of the odd, featuring over 350 exhibits of things that will blow your mind. The whole concept is designed to shock and awe, and its objective is certainly achieved. Unless you have been to one of their other exhibits around the world, you really won’t have seen anything like this before. Ripley’s is sort of how I imagine a 19th Century circus freak show. Exhibits on show are a mixture of real and fake artifacts from a range of genres such as nature, inventions, history and the out of this world. Split into 10 galleries the items on display include shrunken human heads, a mask made of real human skin, torture devices that will make you wince, and even a four eyed man. Along with these very odd displays, you will also encounter some very strange inventions such as a submarine car and the worlds smallest drive-able vehicle. As well as the museum of the odd, there are other attractions here. 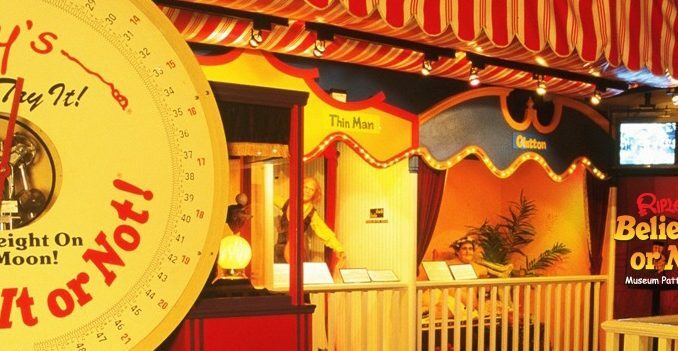 Louis Tussaud’s wax museum is a similar attraction to a more famous London namesake, where you can have photo’s taken with life-size replica’s of the rich and famous. A haunted walk through attraction featuring live and very scary actors, which will leave your heart rate racing. An infinity maze designed to challenge your perception of reality and tingle your sense. And finally a 12D cinema? Ripley’s really is a great all round attraction that is not just popular with tourists and families, but also the locals. The Thais have a strange fascination with the weird and the scary and this certainly satisfies that curiosity. Ripley’s is a great way to break up an afternoon spent in town. Located above a central Pattaya shopping mall, means it is extremely easy to get to and no need to pre book as tickets can be bought easily on the door. Prices start at 300-500thb per attraction, with the opportunity to buy a multi pass for 1400thb which allows you access to all attractions.